The talented team from our Alabama office worked with the client and contractors to select and install an entrance that not only provides ADA compliance and convenience for all that enter/exit, it maintains a rich aesthetics. Making sure entrances are ADA compliant is integral part of successful entrance design. For Piedmont Door Solutions ADA regulations are not limitations, instead they are a way to make a substantial difference in the lives of people living with disabilities. The convenience an ADA entrance provides resonates through the community making entering a building easier for parent’s with young children, elder individuals, the temporarily injured and any person who is overcoming physical limitations. While the importance of ADA complaint hardware can not be overstated, in many cases the aesthetics leave much to be desired. Standard automatic door operators can distract from the architectural statement of a building and undermine the upscale feel a class “A” property aspires to engender. At Piedmont Door Solutions we have become expert at marrying the function of ADA devices with aesthetically pleasing form. On this project we were tasked with retrofitting an older entrance; adding ADA hardware while maintaining a premium finish. 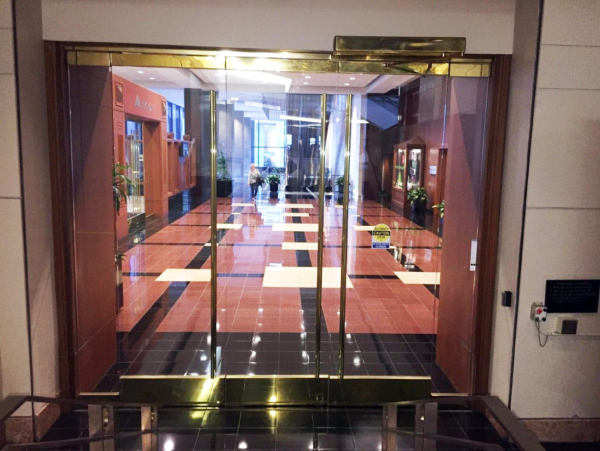 We achieved the desired results by pairing a brass door package with a brass clad operator.